The two prayer books and the supplements were purchased by the City of Vienna together with the rest of the "Bibliotheca Schubertiana" after the death of Ignaz Weinmann and since then were kept at City Hall. That you saw them in 1993 at the home of Ernst Hilmar, could be due to a temporary borrowing for working purposes by Dr. Hilmar; in any case they were not stolen and we "did not buy back" books as you suggest. There was no "new acquisition" in September 2012 as the web site suggests, but only a "new cataloging" of books. Due to their interesting content Mag. Buchberger filed the books under "New Acquisitions" of the collection to present them to a wider audience. Anyway, I would like to thank you for your thoughtful note and apologise on behalf of Mag. Buchberger and the library for the resulting confusion and wish you a Merry Christmas! Why did it take the Wienbibliothek thirty-six years to catalog two prayer books? What happened to the many other leather-bound books from Ignaz Weinmann's Bibliotheca Schubertiana that were seen in Ernst Hilmar's house? Are they not catalogued yet? If no books were stolen and Weinmann's library is still preserved, why was an internal investigation conducted at all? If no books were stolen, why was Ernst Hilmar suspended in 1994? Which books were "erroneously sold" by Herwig Würtz? Where is the "Schubert-box" in the form of a book with gold pressed leather cover and a Schubert portrait that is listed in the inventory of Weinmann's collection? It seems that the Wienbibliothek is desperately trying to get rid of this affair that seems never to end. It will not end, because a) the people who are in charge keep covering up the events that led to the suspension of the head of the music collection and refuse to deal with the matter in an open and honest way; and b) as the attempted sale of stolen Strauss autographs in 2010 has shown, stolen material keeps turning up every now and then. And even when the location of a stolen item is known, it is not recovered by the Wienbibliothek, because the people in charge are obviously afraid that such a procedure could lead to their lethargic behavior becoming known to the public. The responsible city councilman Andreas Mailath-Pokorny came up with the following excuse: "We are unable to do more. The Wienbibliothek is not a detective agency." 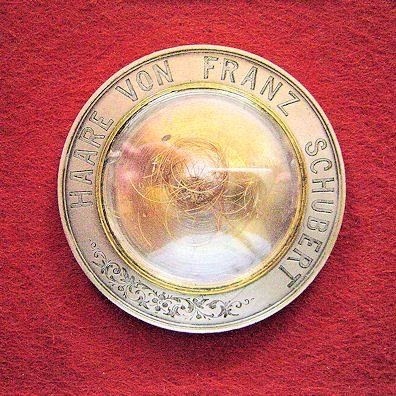 The lock of hair which in 1863 was recovered from Franz Schubert's skull, was stolen from the Wienbibliothek by Ernst Hilmar, and, as of 2003, was on display at the Schubert Museum in Atzenbrugg.